If this were a story about business, we’d say that Kelly McManus Souza is a change agent. If our subject were chemistry, then she’d be a catalyst. But this is a story about sports. Kelly McManus is an athlete. But she’s also both a catalyst and a change agent. Throughout her career, almost wherever she’s laced on a pair of skates, Kelly has transformed teams and programs, bringing them to new and higher standards of performance. Her college hockey days began at the University of New Hampshire. She got a full scholarship to UNH, the East’s dominant women’s hockey program of the late 1990s, and was ECAC Rookie of the Year as a freshman. In her two years there, the team went 47-17-5. Kelly scored 17 goals and 37 assists for 54 points. She was on a roll. But in the spring following her sophomore campaign, Kelly made a bold move. 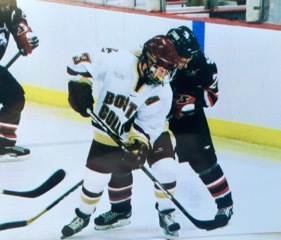 She left UNH and accepted a half scholarship offer from Boston College’s second-year coach Tom Babson. The Eagles wanted to build their program to national prominence. She was looking for a change and had always liked BC. She was one of five transfers and five new recruits to arrive in the fall of 2000. But it was Kelly, more than anyone else, whose presence showed that Boston College was serious about competing at the highest level. “I had an official visit at BC when I was in high school, but UNH was coming off a national championship at the time, and I wanted to play against the best of the best,” Kelly explains. Impact? Here’s what Babson has to say. “You have to understand that BC Women’s Hockey was not the incredible juggernaut that it is today. We were an after-thought program with very few scholarships and no reputation to recruit upon. There were even voices at BC wondering whether women’s hockey was worth the expense. The first year McManus played, BC’s record was 6-26. She had 13 goals and nine assists for 32 points. In her senior season, she had 17-17-34, good for third in goals in the ECAC. The team’s record was 9-19-4 and it included a first-ever berth in the playoffs. Boston College women’s hockey had arrived. Kelly became BC’s first nominee for the Patty Kazmaier Award. Even though Kelly only played two BC seasons, she set several team records. As of graduation, she held the single-season mark for goals, assist and points. For her career, she was fourth all-time in points and goals, and third in assists. Earlier in her career, Kelly had singlehandedly elevated the athletics program at Noble and Greenough School. Nobles won the Independent School League championship in her senior year and has remained at the top of that league ever since. Kelly was a high school All-America for coach Todd Stirling at Nobles. For her high school career, she scored 137 goals and had 98 assists. She also was all-ISL in lacrosse and soccer, and she captained all three sports. “The support I got at Nobles was critical in my development in soccer and lacrosse,” she says, citing soccer coach Beth Riley and headmaster Vic Baker in addition to Stirling. Before Nobles, Kelly played on the boys’ team at Dedham Country Day School. Hockey had been curtailed there, and she successfully petitioned for its reinstatement. She also was a member of the nationally prominent Assabet Valley Girls Hockey Team under coach Carl Gray. Assabet’s Pee Wee team dominated New England and finished second in the national championship tournament in Minnesota. “Coach Gray was the one who really taught me how to deal with adversity, how to play under pressure,” said Kelly. 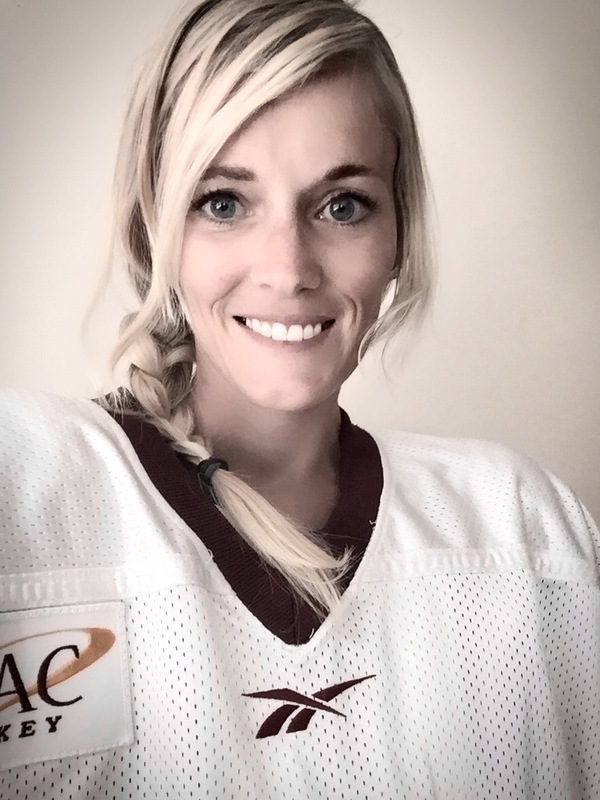 Kelly’s very first hockey coach was her father Mike. He had insisted that Kelly and her sister Krissy stick to figure skating and forgo Dedham Youth Hockey. Bored with that scene after a few years, they badgered him until he relented – but only if he could coach them. Kelly and her husband Mike were married in 2006 at St. Ignatius Church. After graduation, she earned a law degree at Massachusetts School of Law while Mike was playing professional hockey. They lived in Italy for the four years he played at Cortina and have two daughters – Ella, age 8 and Ava, age 5. Both Mike and Kelly have been coaching since returning to America in 2010. She was head hockey coach at St. Mary’s Academy Bayview in Riverside, RI and head coach for the Team Elevate Elite Lacrosse Club at Brown. Mike recently returned to his alma mater to be associate head hockey coach. This entry was posted on October 5, 2015 at 11:29 pm and is filed under Things in General. You can follow any responses to this entry through the RSS 2.0 feed. You can leave a response, or trackback from your own site. Hallo I melden Sie sich aan Ihre Blogs wie jede Woche. Ihre Schrift Stil ist fantastisch, halten tun, was du tust!